No matter whether you’re a professional chef or a home cook making dinner for your family each night, handling and working with food (especially raw food) properly is an essential part of the role. Without a keen eye for good food safety, your food can be contaminated and a lot of additional potential consequences can take place. Thankfully, there are a few easy precautions you can take to stay food-safe, and one of the most important areas is choosing the right cutting board for the right situation. In this post, we’ll look at the pros and cons of different cutting boards and how they play a part in overall food safety. In the marketplace today, there are three standard material types for cutting boards: glass, plastic and wood. While the former two are relative newcomers, wood has long been cut into planks and used as support while cutting and performing other forceful cooking activities. Both plastic and glass have provided additional styles and types of cutting board at different price points, but wood cutting boards are still very prevalent because of their inherent food safety. Glass and plastic boards are very safe in their own regard as well, however. Both are non-porous surfaces and can be cleaned in the dishwasher, making it easy to do away with pesky food-borne bacteria like E.Coli and salmonella. Nowadays, most restaurants and other professional food establishments are required to use plastic cutting boards for this very reason. Nevertheless, the trusty wood cutting board may still be your best bet! According to a rigorous food safety study from a researcher at University of California Davis in the late 1980s, wooden boards may be the most effective at warding away food-borne bacteria because of built-in antimicrobial properties that artificial materials like plastic simply do not have. As board develop deep knife marks and blemishes with repeated use, wooden boards – particularly hardwood species like teak, acacia and cherry – pull down and trap the bacteria to prevent it from spreading. Plastic boards, by contrast, can provide a safe haven for these bacteria if the knife mark is deep enough and cannot be reached by a cleaning in the dishwasher. The effectiveness of wood cutting boards is further amplified when the wood itself is seasoned and maintained properly. Using an all natural oil like coconut oil – an oil rich in antimicrobial properties in its own right – can be an effective treatment that improves the gap in effectiveness of a wood cutting board over its plastic counterpart. Add in some beeswax, and the wood cutting board is a formidable force of food safety. Plastic boards, however, are perfectly great options for food prep related to non-raw ingredients and foods. Herbs, vegetables and non-meats can be handled, chopped and anything else on a plastic cutting board without any issue so long as the board itself is washed after each use. 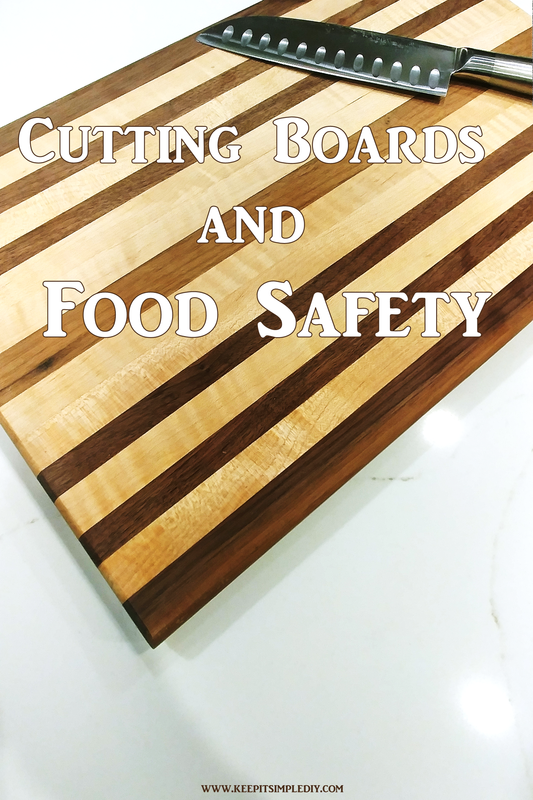 What is best practice when it comes to food safety is to think of each different type of cutting board you own as a role player in your kitchen. Like we mentioned above, a plastic board is great for preparing anything with vegetables, leafy greens or anything else that doesn’t involve raw meat. Meanwhile, a wood cutting board may be best served for raw meats, greasy and juicy finished products and anything that may harbor potential bacteria. Since there’s no mutual exclusivity, using separate cutting boards altogether is a great idea. It’s the most foolproof way to ensure that foods don’t end up with any cross contamination, and it’s simple to keep your kitchen and overall food prep more organized that way. It only takes a few extra moments, but rinsing and cleaning your board after each use (even plastic boards after vegetables) is one of the best things you can do for food safety. Like we mentioned before, plastic and glass boards can be put in the dishwasher easily, but a wood cutting board should be rinsed with warm soapy water so as to prevent any warping. At some point, the useful life of a cutting board reaches its end, and this is particularly true of boards that pose a risk for contaminating any given meal you prepare! Deep knife marks and funky smells are usually dead ringers that its time at least for your board to have a deep cleaning. If the smell and stains still aren’t removed after that, then you need to be extremely careful if you don’t choose to replace your board immediately. Smells, stains and discolorations are all signs that your board is not as healthy as it once was. For wooden boards, you can try to season it, but for plastic boards, there’s not much you can do. Thankfully, most boards are fairly inexpensive and can be replaced, plus it’s a whole lot less expensive than a doctor’s bill that is related to a food-related illness! While it’s easy to take for granted, food contamination can happen at any given time without very little warning or notice. Even using the steps and tips listed above, you can reduce your risks of having anything bad happen, and instead you can focus on the next tasty meal you’re preparing!